•	The foremost advantage of solar powered air conditioner is it helps to cut down the use of electricity. In the United States almost 5 percent of the power produced is used in home-cooling. The power consumed to produce cooling releases almost 140 million tons of carbon dioxide into the air. Under such circumstances if you use solar-powered air conditioner you end up shrinking your carbon footprint. •	Using solar power has many benefits such as conservation of natural resources and a smaller impact on climate change. You do not burn any fuels nor use electricity. It is a go-green initiative. •	Solar power can be used to power multiple appliances in the house. If you are using solar panels for water heating purposes, you can use the same solar panels to power your solar air conditioner. •	Solar air conditioners are durable and require minimal maintenance. This is on account of fewer materials and moving parts. They are also more cost-effective and environmentally-friendly to maintain over the long term. •	Solar power systems integrated with batteries. In cloudy days you or nights will have your air conditioner running on batteries that store sun’s energy when there is light. 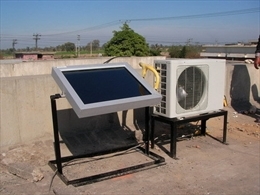 In remote places where the power-grid has not yet reached solar air conditioners are suitable options. These units are totally self-contained, independent of a power utility company; you can pretty much have air conditioning anywhere you want! •	Having a hybrid solar power air conditioner also has its advantage. 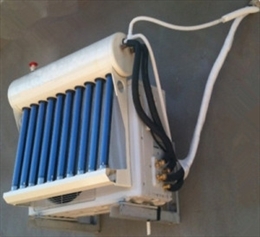 These air conditioners are powered by both solar power and electricity. The A/c would run on sun’s energy when there is enough light. Otherwise it will draw power from the grid. In case the solar power system is producing more power than required by the house, then the surfeit power can be sent to the utility grid. If the house has a net meter then it will show how much power the consumer used and how much has been given off to the grid. Usually, 20-40% of a solar power system’s output goes into the grid. If you supply power to the grid you would get credit from the utility company.